I spent my Halloween this year with amazing friends, eager to share what they knew of the Great Smoky Mountains. 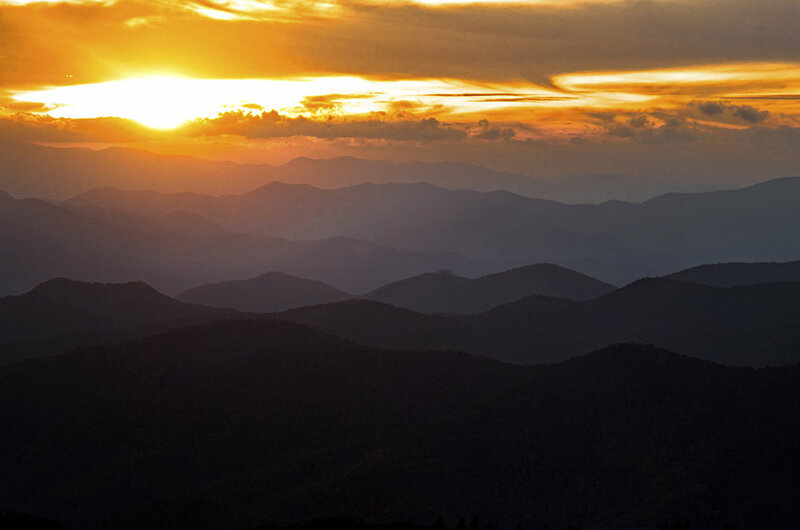 Including this glorious sunset on the Cowee Mountain Overlook. I’ve spent this year open to living and viewing our world through my heart, my senses, my wide-open perspective. No preconceived ideas. No matter how much “real” work I had to do late at night and on weekends and in every spare moment I’ve had, so I could meet my deadlines while exploring non-stop and learning to more creatively share what I’ve found. It’s been a fantastic week. Much more to share from my time in the North Carolina mountains. It’s been a life-changing year, growing my skills and successes as a photographer. Yet I find myself walking, understanding, exploring forward with greatest gratitude for those so generously sharing this path with me. Soon will be my season for finishing long-overdue edits, working head-down with two different authors I’m coaching and ghosting through their own projects, and pulling together daunting pitches for folk art galleries in North Georgia and Eastern North Carolina. Oh, and my third and forth books of photographic meditation that I’m dying to breathe into life. Yes, I’m already exhausted. It’s been an intense journey of learning and studying and building to this moment. And NOW it’s time to take the plunge and grow to it’s next level my vision for the healing Affirmation Photography can shine into the world. But since when has sleeping a little less and working a little harder mattered, when the gains of all that awaits are this grand?